Talk about Timing. I was in the final throws (literally) of packing my bags for a much anticipated trip to Maui and dreaming about sitting under the Banyon Tree in Lahaina where I would relax and do nothing more than watch the people and world go by at a much slower pace than my usual life in Seattle. OK, maybe do a little weaving while hanging out under the Banyon Tree as well. 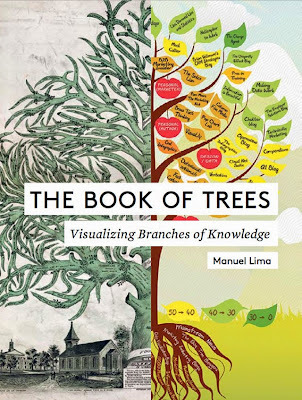 Just then, the mail arrived and when I opened one of the larger parcels I found Manuel Lima's new book, The Book of Trees: Visualizing Branches of Knowledge, eagerly awaiting to be read and reviewed. The timing serendipitous, but even better was that I now had something fantastic to read on the flight Maui! The happenstance of the the Banyon Tree/Book of Trees connection is actually quite fitting though. Native to India Banyan trees have become prevalent throughout the Pacific and much of the tropical world. The trees produce aerial roots that grown downwards toward the ground and eventually become new trunks themselves. The trees are beautiful, lush, and often become gathering places for people to discuss both the important and not-so-important matters of the day. The Lahaina Banyon Tree (Ficus benghalensis or "Paniana" in Hawaiian), located in the Lahaina Banyan Court Park was planted in 1843. Back then, it was only 8' tall. Today, it is over 49' tall, has 16 trunks, and covers 1/4 of a mile within the park. For many, including me, the Banyon tree is a perfect metaphor for the tree-like nature of ideas and knowledge, as well as the interconnectedness of ideas and knowledge as they start and stop, merge into other ideas and knowledge, and create new ideas and knowledge. That is exactly the great gift and takeaway from Lima's newest book, The Book of Trees: Visualize Branches of Knowledge. Fans of Future-ish know that we/I have quite a fetish for what we call "data candy", usually referred to as information visualization, data visualization, or information design. Created as a companion to Lima's first book, Visual Complexity: Mapping Patterns of Information, The Book of Trees explores history, use, influence, and significance of tree-diagrams in great detail. From ancient works in stone and Medieval iconography to modern radial trees and Voronoi treemaps, The Book of Trees covers it all and it does so in a visually beautiful way. The Introduction to the book is a global history lesson in human knowledge, cognition, and culture in itself but it is also immensely valuable in setting the stage for the evolution of tree diagrams through the centuries towards the advanced trees and technologies we have available today. One thing the Introduction and first few pages of each section makes clear though is that even some of the most unique modern tree diagrams that seem to only be possible through recent technology and software actually have their origins in diagrams imagined centuries ago. To that end, I particularly enjoyed running across tree-diagram examples that merge ancient ideas with modern data technologies (such as the radial tree, “Greek Myth Family Spiral”) or vice versa (such as the vertical tree “X-Men Family Tree”). I could have highly recommended this book to any reader without even opening the cover. But having done so (and having spent so many hours drooling over all the data candy), I can honestly and sincerely say, I highly recommend this book. To any reader. Seriously. Young, old, design geeks, and info fashionistas. This book, along with Visual Complexity, should become the new standards for coffee table books for people with a passion for science, design, and culture.